If you notice the whites of your eyes, or the sclera, suddenly turn a shade of yellow, take heed, as it may indicate an underlying health problem with your liver. Scleral icterus can also be the sign of an obstruction of blood flow preventing the body from eliminating its waste. The discoloration may be resolved once the condition itself is treated or at least managed under close medical supervision. We will look at the symptom referred to as scleral icterus and other symptoms that may be associated with the conditions behind it. A classic scleral icterus definition refers to the excessive presence of bilirubin in the bloodstream, causing the yellowish coloration of the eyes. It is linked to liver disorders as bilirubin, a pigment, passes through the organ before being expelled from the body. Bilirubin is orange and yellow in color, and is created by the breakdown of red blood cells. When the liver is not working as expected, the bilirubin levels increase in the blood, resulting in scleral icterus. It is important to note that scleral icterus is a symptom and not a disease or disorder. 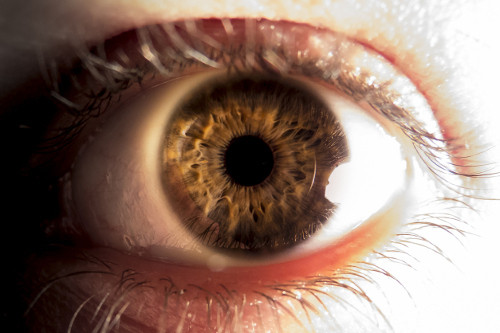 It causes the whites of the eyes to darken, ranging from a bright yellow to dark orange color. This does not affect the vision. This coloring can fall into one of three classifications: pre-hepatic, hepatic, and post-hepatic scleral icterus. Due to improper functioning of the liver, the bilirubin is not expelled, and it remains in the blood to circulate throughout the body, including the eyes. This can happen before, during, or after the expected processing in the liver, depending on the underlying cause behind the liver function failure. To stop or prevent scleral icterus, the root cause must be determined and treated. Once this is done, the eye color will return to normal. More commonly known as a gallbladder attack, this condition may cause scleral icterus as a gallstone can block the bile duct. It can also cause pain in the upper right abdominal region, which can radiate to the shoulder or back. The condition can occur with any gallbladder disease. Caused by excessive alcohol use, alcohol hepatitis is inflammation of the liver. It can cause serious damage to the liver, preventing it from working as a filtration system. This herpes virus strain is generally referred to as mono. The infection may affect the cells of the liver by forming an obstruction and increasing the bilirubin levels. This would cause the eye discoloring. Both infections directly affect the liver and can lead to damaging consequences. Scleral icterus can happen with either form. There are known medical conditions that may cause scleral icterus, such as hepatitis C, sickle cell anemia, cirrhosis, and even a direct injury to the liver. In addition, there are 40 rare conditions linked to this symptom, including hepatitis D and E; liver, gallbladder, and pancreatic cancers; Gilbert’s disease; Wilson’s disease; and an overdose of acetaminophen. As previously mentioned, scleral icterus is a symptom, not a disease. However, there are signs that accompany this symptom, and may indicate an issue with the liver or bloodstream. The primary telltale sign is, of course, the yellowing of the eyes. The yellow hue may also be present on the skin of various parts of the body, including the head. Itchiness may also arise, and can be felt deep within the body. Other symptoms may include fatigue, abdominal pain, pale stools, weight loss, vomiting, or fever. The diagnosis will take all of the symptoms experienced by the patient into consideration, as well as the results of clinical tests. The bilirubin levels in the bloodstream are measured in addition to the number of liver enzymes. This could be necessary for those who may naturally have cream-colored sclera, such as patients with darker skin tones, as a light shade of yellow may be difficult to detect. Scleral icterus treatment focuses on the condition that causes the symptoms. The yellowing of the eyes, and skin in some cases, will disappear once the underlying condition improves. With liver failure, most of the symptoms can be addressed once a transplant is done. The same improvement is seen in newborns with scleral icterus following phototherapy sessions on the eyes. While many conditions can be completely treated, there are some that can only be managed. Scleral icterus is a treatable symptom that affects the coloring of the whites of the eyes as a result of liver damage or blood flow problems. The underlying causes may lead to irreversible damage that can have fatal outcomes. Most conditions can be treated or managed with appropriate measures. This will help to resolve the scleral icterus. “Medical Conditions That Cause Scleral Icterus & Its Treatment,” ePain Assist; https://www.epainassist.com/eye-pain/scleral-icterus, last accessed May 9, 2017. “What Is Scleral Icterus – Definition, Symptoms, Causes, Treatment,” Health Care Tip; http://www.healthcaretip.com/2017/02/What-is-Scleral-Icterus-Definiton-Symptoms-Causes-Treatment.html, last accessed May 9, 2017. “When Gallbladder Problems Lead to Binary Colic,” Everyday Health; http://www.everydayhealth.com/gallbladder/when-gallbladder-problems-lead-to-biliary-colic.aspx, last accessed May 9, 2017. “Alcoholic Hepatitis,” Mayo Clinic; http://www.mayoclinic.org/diseases-conditions/alcoholic-hepatitis/home/ovc-2016392, last accessed May 9, 2017. Verkh, D., “Epstein-Barr Virus: Cholestasis, Hepatitis, or Both?”, European Medical Journal, November 15, 2016; http://emjreviews.com/blog/epstein-barr-virus-cholestasis-hepatitis-or-both/, last accessed May 9, 2017.